That was the comment the client made when this project was finally installed. The doors are hollow core and finished off with maple pommele and bamboo veneer treated with dye colors. The finish is Sherwin Williams pre-cat high build lacquer T77-F57. The handle is a solid copper rod that I made a jig to bend. This was my first attempt at something like this and it worked out well. The copper is brushed and finished with a Sherwin solvent based acrylic finish. The overall dimension is 9’ high x 4’ 6” wide. The doors are 8’ high. The big door is 37” wide and the narrow door is 14” wide. This asymmetrical door pattern adds visual interest but is practical as well. The big door opens to the wall and the small door takes up less space as it opens in the area of the foyer where people tend to stand. The interior is all black lacquer and has lots of storage. New lighting was installed in the ceiling to illuminate this piece. When viewed from the side, it plays off of the big mirror on the wall with the double image. I don’t get tired of looking at this Todd. I bet they are very happy. Your dedication and follow-through were amazing on this project. Plus you got to try out the hardware. Great work! It is art. Looks like art to me! Fantastic job Todd. I’ve been following the journey. I’m glad you could finally post it to your “projects” and I bet you are too. It’s beautiful. Todd, this is just as beautiful as it was the first time. I bet you are really happy that you finished it – especially to the customer’s satisfaction. Great workmanship – hope YOU got your right change for it, I know the client got a great piece of functional art. Man, you have taken this craft to an entirely new level. You are a true artist. great job. I don’t have words enough to describe it. Awe inspiring comes to mind, but falls short. You are an artist as well as a craftsman Todd. 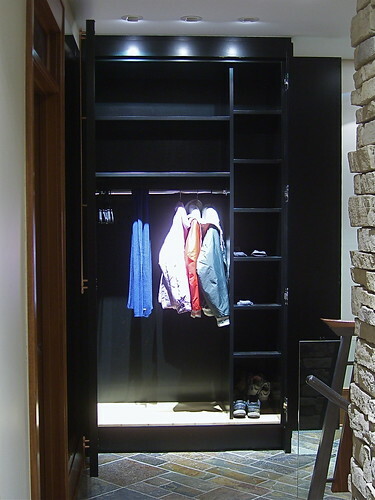 Man I love this closet! and your photos are art as well. I was trying to envision the view from the hall—you’d see the two mirrors and then the silver handle …it would basically disappear until you got in front of it and then BAM …. wow.. Very nicely done Todd, looks fantastic! Likewise, I never get tired of seeing pics of this, it is amazing. Of all the great accomplishments this ranks up a the top. Great work Todd. 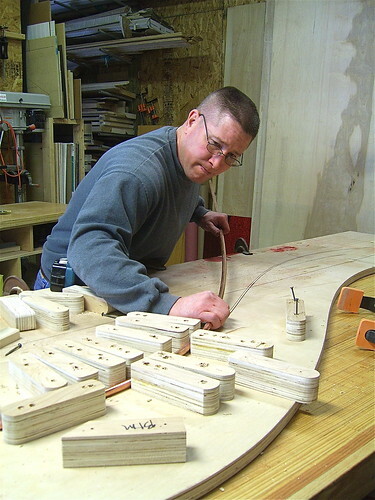 Wow, just building that bending jig looks like a bigger task than I would want to take on! Another beautiful project, Todd! Well Todd, a woodworking artist. What more could be said. Well lots really. The Cooper’s thought the jig made a good abstract piece. After watching this project and others here, I’m learning the value of quality jigs and templates. The only word for this is beautiful. An example of quality craftsmanship.